Yoga offers many obvious benefits: It strengthens our muscles, limbers our bodies, energizes our spirits, and calms our minds. One of its greatest gifts, however, is more subtle and profound: Yoga teaches us to see the truth of life more clearly. When we practice with intention and intelligence, we begin attending to details in our bodies and lives that we previously had overlooked or even misunderstood. Why do we care about seeing clearly? As my wise mother likes to say, "When we are aware, we have a choice." When we see clearly what is going on within and around us, we are better equipped to make wise decisions and respond appropriately to the needs of the moment. Buddhist teacher Sylvia Boorstein puts it this way: "When we see clearly, we behave impeccably, out of love, on behalf of all creatures." Parsvottanasana, sometimes called intense side stretch or split-legged forward bend, is a complex and challenging posture that offers an exceptional opportunity to practice the fine art of seeing clearly. 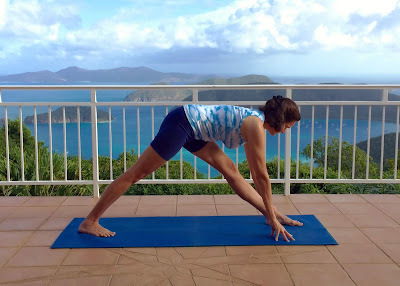 One part standing pose, one part forward bend, and one part balancing posture, this asana requires tremendous concentration and clarity of mind. It challenges us to be certain about which parts of our bodies we are holding steady and which parts we are moving into action. In the process, parsvottanasana strengthens and stretches the legs, hips, and torso, all while offering the mind a well-deserved chance to grow cool and steady. Before we begin, let’s explore a simple standing forward bend that incorporates the fundamentals of parsvottanasana. Stand a few feet away from the wall in tadasana. Place your hands on your hips and make sure that the left and right sides of the pelvis are level and equidistant from the wall in front of you. Maintain this evenness as you lift your arms over head and then fold forward from the hip joints, forming a deep crease at the top thighs. Press the hands into the wall, positioning them so that you form a long, straight line from the wrists all the way to the tailbone. Notice how the pelvis maintains its symmetry while tilting forward, with its left and right sides still the same distance from the wall. Breathe comfortably, and invite your shoulders and hamstrings to settle into this delightfully refreshing stretch. After a few moments reverse your movements to return to tadasana. Now let’s explore the same forward folding action at the wall, only this time with the legs in the scissored stance of parsvottanasana. This small change in leg position will up the ante considerably, since the upper body will be asked to remain symmetrical just as in the previous exploration, while the lower body will be asked to move in a very different fashion. Believe me, seeing clearly which parts of the body are moving and which aren’t in this exploration is not as simple as it sounds! To begin, stand facing the wall with your left foot three to six inches away from the baseboard, toes facing forward, and your right foot two to four feet farther back, right toes turning outward just a bit. Stand firmly and with confidence, straightening your legs and gently hugging the leg muscles into the bones. When you are confident that your hips are level and balanced, extend your arms overhead and tilt forward from the pelvis until the hands rest on the wall. Keep the spine spacious and expansive, forming a long line from the base of the spine all the way up through the hands. Deepen the crease at the top hips, and continue lengthening enthusiastically along the front of the body - climbing upward from the pubic bone to the navel, from the navel to the rib cage, from the ribs to the heart and from the heart to the crown of the head. Invite the front body to feel expansive and buoyant. Now ask yourself whether perhaps in the process of dipping forward you have let the hips spin off kilter toward the back leg, causing the spine to kink and the belly to laze around toward the right. If so, even out the pelvis just a bit by drawing the front thigh away from the wall while pressing the outer right hip forward. When you have mastered this action, the two sides of the body from the hands to the tail will feel balanced and even, and the navel will gaze forward. This means that a marble placed on the back of your head would roll straight down your spine to your tailbone, falling directly to the ground behind you, instead of veering off course to the left or right. Breathe enthusiastically for several moments, enjoying the opportunity to stretch your legs and lengthen your spine. When you are ready to emerge, step your back foot toward the wall, release your arms to your sides, and stand in tadasana. Repeat this exploration on the second side, with the right leg forward and the left leg back. This modified parsvottanasana using the wall for support may be enough of a challenge for now. There is a lot to consider in this posture, and if you want to be precise about which parts of your body are moving and how. In other words, if you want to see clearly it is wise to slow your pace and proceed methodically. Commit yourself to a steady path that allows you to see clearly every step of the way. If you are able to maintain your composure while practicing this pose at the wall, you may like to explore a more challenging version of parsvottanasana using blocks to support your hands. Stand in the center of the room with the left leg forward, toes facing forward, and the right leg two to four feet behind, toes turned out just a few inches. Position two blocks at their tallest height by either side of the front foot. Stand steadily with both legs straight, making deep footprints into the earth. Let that grounding action rebound up through your core. Lengthen your spine wholeheartedly toward the sky. Before folding forward, place your hands on your hips and balance your pelvis just as you did while practicing parsvottanasana at the wall. Commit the imaginary eyes of the pelvis to looking forward. Inhale as you joyfully extend the heart upward, and let an exhale carry you into a swan-like forward bend initiated from the base of the pelvis. Be clear about your actions - the legs stay straight and stable, the pelvis rotates over the thigh bones, and the spine stays long, even and steady. Pause here and reach your hands forward toward the blocks. If this action forces your shoulders to slouch or your spine to round, then back off. Be wise, and keep your hands on your hips for now. As your body grows more limber you will be able to crease more fully at the hip joints and settle more completely into the pose. If you are able to reach the blocks without rounding your spine, press the hands firmly atop each block with the fingers facing forward. Let this rooting action straighten your arms and buoy your heart upward. Reach back through the back pockets of the pelvis, pressing back enthusiastically. Invite the front spine to telescope gracefully from the pelvis forward toward the space beyond the crown of your head. Here’s a good test of clear seeing in this pose: If you’ve managed to stay long and anchored in the legs, as well as even and balanced in the hips, when you settle into parsvottanasana both sides of your back will be long and even. A friend should be able to place a glass of champagne anywhere on your back body and walk away without fear of it spilling to the ground. Once you’ve established this balanced alignment, breathe steadily and be firm in the core of your body, supporting your torso from deep within. Imagine that your spine is floating on the surface of the sea - buoyant, bubbly and light. Invite your brain to grow cool and spacious, and settle in for a few long and satisfying exhalations. As you linger in the deep forward fold of parsvottanasana, challenge yourself to see clearly, to attend fully to the sensations of the moment, and to be honest about what is and isn’t happening in your body, mind and breath. Enjoy the opportunity to soak up every last bit of clarity, steadiness and ease this moment has to offer. After several quiet breaths, place your hands on your hips and let an inhalation waft you back up to standing. Step your legs together into tadasana, and notice how the previous exploration has transformed you. Which leg feels longer? Which hip feels fuller? Which side of your spine feels more expansive? Has your breath changed as a result of this exploration? When you are ready, repeat parsvottanasana on the second side, with the right leg forward and the left leg back. As you gain confidence and clarity in this posture, you may like to explore an even more challenging expression of parsvottanasana, with the hands behind you, each grasping the opposite elbow, and your heart dipping more deeply toward your shin. This is a complicated and demanding action, but with patience and practice you will find yourself moving deeply into this graceful pose - strengthening your sturdy legs, extending your buoyant spine, and cultivating a steady sense of balance, stamina and clarity that originates deep within.